Bits of My Own: I am not sure I like this background. 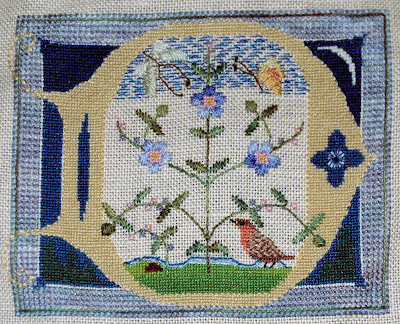 After frogging, re-frogging, and frogging again, I finally finished the area inside the big D.
The forget-me-nots proved to be challenging because the chart showed the easier choice, rather than the written directions. I decided to follow the written instructions which were considered a bit more difficult. The forget-me-not is made up of 3 different parts. In the center, there is a tiny gold eyelet. This is surrounded by 12 tiny cross stitches (one over one). This area is surrounded by satin stitches, of varying lengths using the silk. The buds on the stem are made with Smyrna stitches. At the top, there is a dragonfly in the upper left, and a butterfly in the upper right. These are both done in silk with satin stitches. At the ends of their antennae are petite French Knots. 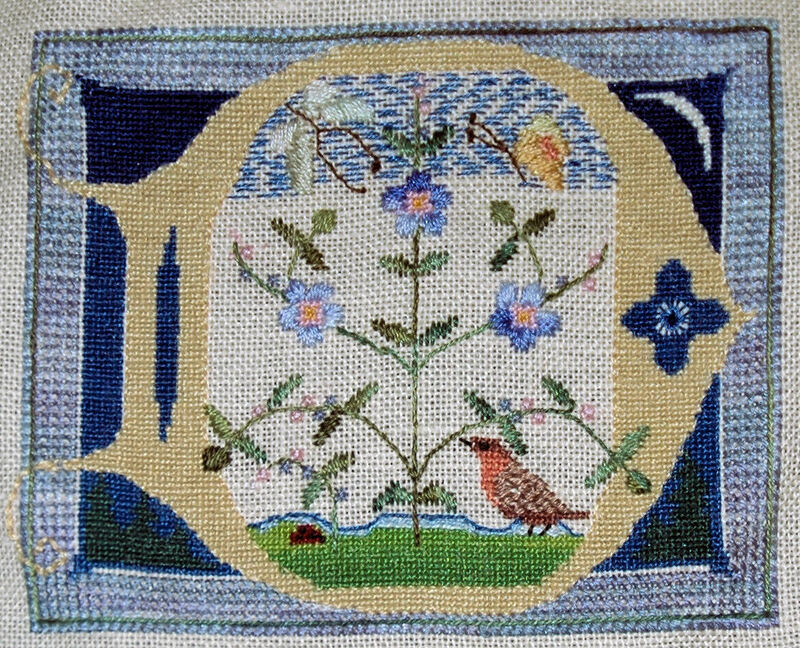 The background stitch is done in a darning stitch. There are 5 colors of cotton floss used here. The top is the darkest, which fades to the lightest color at the bottom. I can't decide if I like this or not, It seems to muddy it up a bit. It is harder to see the small details. Not sure if I like it, but I don't know how it would be without any background. Maybe it should be lighter? On a different note, we had some eggciting news! Gretchen presented up with a little egg! She is about 2-3 weeks early. I understand that sometimes they do that before the regular egg production begins. It is a perfect little, light brown egg! It is hard to tell from the picture, but it is much more slender than a normal size egg. I hope you have all been having a nice summer! The D is just beautiful. All those different stitches must be very interesting! What a cute little egg! I think you're right about the darning stitch in the background. I'd be inclined to leave it blank. I think it's because of the gaps between the stitches? The piece is gorgeous though and the flowers are worth all the hard work! Oh my gosh, it's getting prettier and prettier! Wow! I think the piece is lovely. Generally speaking, though, I am not a big fan of the darning stitch as a fill stitch. How does the photo of the model look? I might be inclined to fill the background in with a paler blue done in the basket weave stitch or tent stitch if I didn't like the model photo. It's looking gorgeous. Congratulations on the egg! Sorry about the frogging! The blue background is busy, IMO. Otherwise, looks great. It looks absolutely gorgeous and I love all the little details in the flowers. As for the background - I'd go with Riona and fill in the background with a much lighter shade of blue. But that's just me.